Pinto beans are a very good source of cholesterol-lowering fiber, as are most other beans. In addition to lowering cholesterol, pinto beans' high fiber content prevents blood sugar levels from rising too rapidly after a meal, making these beans an especially good choice for individuals with diabetes, insulin resistance or hypoglycemia. When combined with whole grains such as brown rice, pinto beans provide virtually fat-free, high quality protein. But this is far from all pinto beans have to offer. 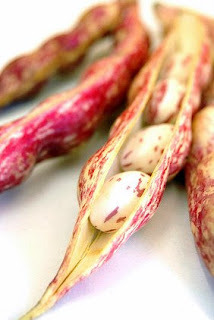 Pinto beans are also an excellent source of molybdenum, a very good source of folate and manganese, and a good source of protein and vitamin B1 as well as the minerals phosphorus, iron, magnesium, potassium, and copper. With these good info on Pinto beans, how not to make soup with them. Put all the ingredients in the pressure cooker and put in enough water to cover all the ingredients. Pressurized for 30 minutes and when the pressure is totally released. Open the pressure cooker lid and add in more water. Bring the soup back to the boil and adjust the taste with salt and pepper.